And that’s my hope for this carnival, that you’d find at least one tip or piece of advice that you can really use to help your school year go even better. And I also hope that it’s fun! And that you find some new blogs and that some new followers find yours. So let’s get to it, shall we? I’ve written about our ‘students’ before: Princess (11), Drama Queen (8) and Little Prince (5). I’ve written about their different learning styles and how I try to teach with that in mind. Drama Queen has come a long way with her handwriting but there’s still room for improvement. I’m going old school on this one — good effort with her handwriting will earn a smiley face sticker on the assignment. It’s so easy – but I know that it will motivate her. My overall hope for our school this year is that we can enjoy learning together, REALLY learning together, despite the hormones and the sibling rivalry and the pesky little brother. I pray that God gives me the wisdom how to deal with the parenting while doing the schooling! I pray that I succeed in teaching them about God and spiritual disciplines while teaching them about the world He created. Now it’s your turn to link up and tell me/us about your school, your students, and/or your goals for the new year! ~ You can find the Back to (Home) School, Week 2 post here. I am also trying to up the writing in our home. WIth both my 6th/8th grade boys. I am wondering what Writing Curriculum you found? We decided to go with Writing Strands 3 (ages 8-12) to supplement the grammar/language arts we’ll be using (The Mother Tongue by Nancy Wilson.) It arrived in the mail yesterday and I poured over every page. I already love it! It’s just the kind of thing we need to build our writing skills! Thanks. I will look into Mother Tongue. Writing Strands has some wonderful writing exercises. Thank you also for sharing so much on your blog. I have gleaned much in a short time. Blessings. Just “hopped” over from the HHH. I am so glad that I happened upon your blog. I will be reading the responses to your post, as well as your subsequent posts, as I, too, am making some curriculum decisions for my 4 kiddos for the upcoming school year. Thank you, I hope we get some good participation and ideas to browse through during the Back to Home School series. I’ve already had some good feedback on some books and ideas we’re going to be using this year. Feel free to join in! I’ll be hopping over to your blog, too! Just found you from HHH as well. 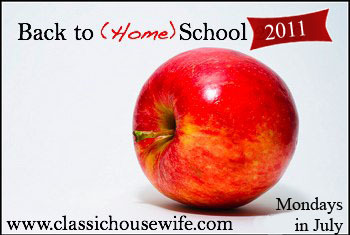 I was just thinking that I needed to write up a homeschool posting about next school year yesterday, so I will plan on participating once I get mine written. Thank you!! I’ll hop on over to your blog!